In what has been the bloodiest week yet in President Duterte’s war on drugs, critics of the crackdown now have a name, and a face, to serve as a focus for opposition. Last Wednesday (August 18) 17-ear-old student Kian Loyd Delos Santos was shot dead by police after they claimed he had resisted arrest and fired at them. However, CCTV footage, witness testimony and autopsy evidence all appear to contradict this claim. Now the three police officers are suspended and in custody and investigations are underway. “Should the investigation point to liabilities, my warning to all is there will be a prosecution and they [police] have to go to jail. That I can assure you. [When asked if he would attend the teenager’s wake] “Do you want me to be pretentious like a politician if I’ll go there? I’ll be pretending. “We knock on the consciences of those who kill even the helpless, especially those who cover their faces with bonnets, to stop wasting human lives. “I would like to express my deepest sympathies to the family and loved ones of Kian delos Santos. Whether or not he was involved in the use or trafficking of illegal drugs, he did not deserve to die in the manner that he did. “Even President Duterte said, if police murdered Kian delos Santos, he will be the one who will bring them to jail and that is the clear stance of the president, which making it clear that he is instructing the police to do their duty but not instructing them to violate the law. “This is an opportunity for the Senate to assert independence, uphold justice and stand with the Filipino. “A lot of our countrymen are saddened, angered and calling to an end of these killings wherein poor Filipinos are always the victims. 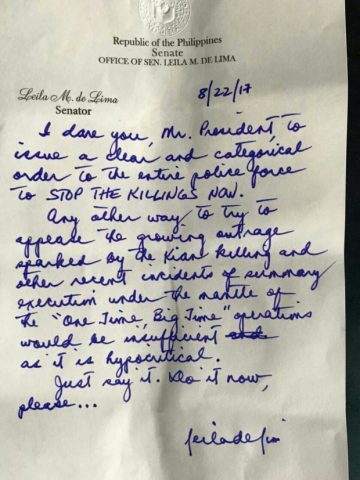 [In a hand-written statement issued from her jail cell] “I dare you, Mr President to issue a clear and categorical order to the entire police force to STOP THE KILLINGS NOW. “Any other way to try to appease the growing outrage sparked by the Kian killing and other recent incidents of summary execution under the mantle of the “One Time, Big Time” operations would be insufficient as it is hypocritical,” De Lima said. [On his order that church bells be tolled daily to demand justice for the dead] “Let the ringing of bells also signify the diocese’s strongest condemnation of the continuing killings, which are being justified as necessary in the war [on] drugs. Northern Police District Chief Superintendent Roberto Fajardo. [On Chf. Supt. Fajardo’s accusation, above] “You already killed him, and you would still besmirch his name? That is how evil these people are. To them everything is propaganda. You know, this is something personal to me because he was the same age as my youngest daughter. That’s why when these things happen, you will think that if it happened to him, it could also happen to our children.